For the last year, I’ve been planning our annual, week-long backpacking adventure with my mates McL and Franken. Planning involved numerous gear purchases chronicled here, including a new sleeping bag, pad, cape, steripen, etc. Training included numerous training hikes also chronicled here, including weekly trips on the Marquam and Wildwood trails and a couple of ascents on NW Mountains. Mountain climbing was really only a series of rest stops on the road to a lengthy backpacking trip as only the latter provides enough time away to purge the daily grind from my inner being!This year it seemed certain that we were headed for the Graves Creek Trailhead and the Enchanted Valley/LaCrosse Basin loop. I had given up my goal of completing the ~45 mile Northeastern Olympics Loop in 2009 as a result of Frank’s desire to return to the Enchanted Valley. These plans, it turned out, would crumble as a result of McL’s quadriceps muscle and Frank’s work priorities. Given that I dropped considerable coin and time in planning/preparing for a trip and that we had already agreed on a mid-September date, this didn’t provide many opportunities to rethink the plan as pushing to October would bring uncertain weather and harsher climes. It did, however, provide enough time for me to realign my sights on the Northeastern Olympics Loop for a second time in 2009! When all else had failed and before I had formally asked, Flight suggested that I take the trip by myself after discussing what had transpired with a girlfriend. I didn’t even need to make a pitch/plea for this to happen! This is where I had to put aside any doubt in my ability to conduct this hike . . . solo!. This would be my first solo hike. In bear country. Without a companion to share a laugh, thoughts on which way to travel, or a yell should a bear invade our camp ground! People that I discussed this with, outside of BPL, thought this plan to be crazy. I would be joining an elite status of backpackers who forgo companions and rely solely on their skills and experience while on backcountry jaunts! Ploss: Hi, I’m planning to hike the Northeastern Olympics Loop from Deer Park>Gray Wolf Pass>Dose Meadows>Cameron Pass>Grand Valley>Hurricane Ridge>Deer Park in three days. What would you recommend? Ranger Smith: I can’t make any recommendations as I cannot assess your fitness level. Ploss: I’m only asking for recommendations on where I should stay for the two nights and I’d prefer to not carry a hard-sided container unless there’s no other option. The park website indicated that I should call to get the latest information on park bear wires. Ranger Smith: There’s bear wire in the Dosewallips area at Bear Camp and at the lakes in the Hurricane Ridge area. The problem is that there’s not suitable trees in the high country around Gray Wolf Pass. Falls Camp is really your last best location before the high country unless you can make it 20 miles to Bear Camp. Ploss: I was hoping to travel ~13 miles on day 1. Are there no other places where I can hang before Bear Camp? Ranger Smith: As long as you can hang 12 feet up and 10 feet out from the nearest trunk, your food is legally stored per park regulations. Ploss: What about my second night? Where would you recommend that I stay? Grand Lake? Ranger Smith: I’d recommend Moose Lake as it’s in higher country. Let me check if there’s availability. Yes, there’s availability on 9/13. Ploss: Okay, let’s go with Moose Lake. That’ll be a tough day! How is the water situation on the trail? 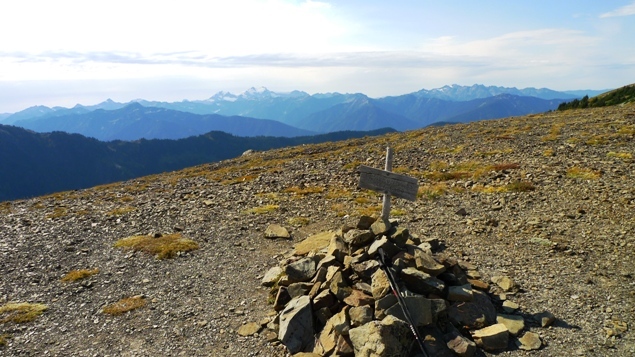 Ranger Smith: The only area where there isn’t a lot of water is the Hurricane Ridge section of the trail, beyond Grand Lake if you’re headed out via Obstruction Peak. I’d recommend that you carry two liters of water for that section of the trail. Ranger Smith: Also, I also recommend that you park near the ranger station at Deer Park when you arrive and hike east to the Three Forks trail head for your departure. This way, you’ll arrive at your car when you return to Deer Park rather than having to hike the last .5 miles on the road. Ranger Smith was extremely helpful and charged me a total of $9 for my permits (a $5 Wilderness permit with a $2 per night fee). I was able to pay over the phone and he emailed me my permit! This would save me from having to handle this the morning of my hike and thus save precious time given a 4.5 hour drive from Portland to the trailhead. On paper, this appeared to be a pretty brutal hike given the 45 mile length with 12,000 feet of elevation gained in 3 days. My camp locations would dictate how far I could travel and just how long my second day would be with more than 20 miles between Falls Camp and Moose Lake! With all that said, I gathered up all of my belongings and assembled my grub for the trip, including an assortment of oatmeal, GU, bars, and two freezerbag dinners (pasta with pesto and cous cous w/vegetables). I departed at the brutal time of 4:15am on 9/12 traveling on I5 to Olympia, WA and heading north on Hwy 101 beyond Sequim towards Port Angeles. I made the left turn onto Deer Park Rd and drove 16 miles to Deer Park @ 5300ft, arriving at 8:45am, ready for my hike! Per Ranger Smith’s direction, I hiked the .5 miles on the road to the Three Forks trail. It was better to “suffer” this section of the hike first, rather than last! The Three Forks Trail starts with a 3300ft descent to Three Forks camp at the confluence of Grand Creek, Cameron Creek and The Gray Wolf River. I saw three hikers that were completing the loop in counter-clockwise fashion on my descent. They had spent about 7 days on the trail and they looked as if they had been beaten down, probably because it’s a steep ascent from Three Forks Camp to the trailhead! Upon hearing what I was planning for this hike, they thought I was nuts when I told them that I was trying to reach Bear Camp for my first night! This was a foolhardy goal indeed, as I would find out later on . . .. 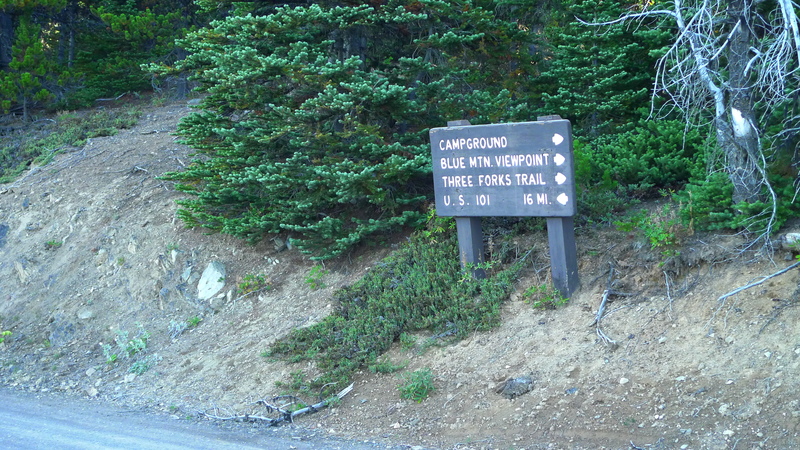 I reached Three Forks Camp at ~11am, having traveled about 5.2 miles. This is where I made a critical navigational error and took a right on the Cameron Creek trail instead of heading south on the Gray Wolf River trail. I “knew” that this didn’t feel right within about 15 minutes, but I assumed that there would be additional signage along the way. I hiked for an hour on the Cameron Creek trail before I confirmed my error with a review of my map and turned around for the hour hike back to Three Forks. This cost me my goal of reaching Bear Camp and added ~4 miles to my total mileage. NAVIGATIONAL FAIL!! I misinterpreted the sign to read that a right turn would take me to both the Greywolf and Cameron Creek trails. Note that the signage is inconsistent in its spelling of gray/grey! When I reached the Greywolf trail, I was discouraged. It was 1pm. I’d nearly traveled 10 miles and had to travel another 5.7 miles to Falls Camp. This is where it would have helped to have a companion with me, for hopes that together we would have been able to decode the signage to find the right route the first time. Bear Camp was definitely out of the question as a day 1 goal! I met two additional hikers on my way from Three Forks to Falls Camp. A pair of dudes were hiking the loop from Obstruction Peak counter-clockwise and another triumvirate was traveling with a handfull of mushrooms towards Three Forks. I didn’t inquire about their bounty, but assume that it was mushroom season. I reached Falls Camp @ 4:14pm, bringing my mileage total to between 14-15 miles. The remains of Falls Camp Shelter. Apparently the fire only destroyed the shelter and its denizens. At Falls Camp, the question really was a matter of how far I should try to go on day 1, recognizing that day 2 would be brutal with 4 mountain passes to overcome. Had I studied my map more closely, I would have realized that the Cedar Lake trail was nearby, but I missed this section due to the fact that there wasn’t any signage indicating this. As such, I continued on a path towards Gray Wolf Pass, carefully reviewing the tree-line for places where I could hang my food for the night. I hiked for an additional 2 hours fifteen minutes until I reached a row of trees near 5000ft. There were a couple of camp spots and trees that could be used for hanging a bear bag. I estimate that I traveled another 4 miles for a total of 18-19 miles for day 1. I had hiked pretty-much nonstop for almost 10 hours and had gained about 4000ft total in elevation. I hung my bear bag first using the PCT method and proceeded to make dinner and setup camp. Needless to say I was effing tired! Successful bear bag and in accordance to park rules! Camp for night 1: only a bivens was used due to lack of available energy! A black-tailed deer that wanted to chill with me at my camp! I’ll note that my camera has only 2.5x zoom! This is when things got interesting. This was the first night that I’d ever spent alone in the wilderness. While I’d normally listen to tunes at night, I didn’t consider this to be an option due to the risk of having to defend my campsite from a marauding bear. This didn’t happen, fortunately, but my black-tailed deer friend traveled through my campsite all night long which made for a sketchy sleep at best! I’m not sure how much I slept, if at all. I’m not sure how much of that was related to being alone or just being outdoors (on the WLT last year, I didn’t sleep that well either). Regardless, I made a plan to carry a sleep aid such as Tylenol PM on my travels moving-forward. I got up promptly at 6:30am and began the process to lower my bear bag. Due to my novice knot tying around the stick suspending my bear bag, it took me almost 30 minutes to get to my belongings. I finally had to break the stick to remove it and lower my food from the bough above. I would have enjoyed having Frank’s knot knowledge so that I could have gotten an earlier start, but oh well, it was a successful hang! I threw down some dry oatmeal and a Gu2o and packed up my belongings for a rough day 2! I brushed my teeth with Dr. Bronners soap, which was not too bad. It would have been worse had I not traded in my prison-issue toothbrush for this trip. I got back on the trail just before 8am. Looking down as I was ascending Gray Wolf Pass, I realized that I had camped next to a tarn, a small pool on the hillside. While I wouldn’t call this a FAIL, it was not my most observant moment, but I must admit that I wasn’t looking to gain any additional elevation on day 1! Oh my, I camped next to water last night. Bloody hell! From here, I climbed up to the top of Gray Wolf Pass @ 6150ft. This would be the first of four passes in between my starting location and Moose Lake. WTF was I thinking??? It was about a mile from the tarn to the summit. Photographic proof that I actually was there at Gray Wolf Pass! From here, I descended 2500ft to the Dosewallips trail which was full of meadows and campsites with bear wire! This area was very similar to the meadows of the Enchanted Valley/LaCrosse Basin area. Although the signs indicated that the nearby areas had been destroyed by a wildfire, there was no sign of any damage on this portion of the loop! Fluffy little clouds and green valleys! I reached Bear Camp at around 11am. It was a nice camp with several sites, bear wire and a shelter with bunks. While a shelter would generally sound like a good idea, they are full of rodents. The shelter at Bear Camp, in particular, had much evidence of mouse feces on all of the nearby wood. Olympic Park shelters, while nice to look at, are definitely not places where I’d like to stay for a night! Bear Camp Shelter: fun and mouse feces! After a quick break, I made a dash for Dose (pronounced Dosie) Meadows for lunch, around noon. Another beautiful meadow, again, with bear wire! These were a couple of areas that would have been worth a longer stay. Unfortunately, I’d only made it over my first of four passes for the day and hiked only 7.9 miles, so could only afford 30 minutes of rest; this did not afford me with an opportunity to see one of the bear that apparently frequent this area! I’ll note that by this point of the trip, my food was no longer appealing and I realized that my meal plan would no longer work for me on these trips. I NEEDED SOME REAL FOOD (not that I could do anything about it)! Dose Meadows. As fine as any other meadow that I’ve seen in the Olympics! Fortunately I had a break before I climbed Lost Pass! While only 1100ft higher than Dose Meadows, it was a near-vertical trail for ~1 mile! Next up: Cameron Pass. Cameron Pass, one of the highest passes in the Olympics @ 6450ft, is nearly 2 miles and 1500ft higher than Lost Pass. It afforded me with a view of a nice meadow adorned with myriad blueberries for my enjoyment! And I did enjoy! I reached the pass just before 3:30pm, bringing my mileage total to about 10.8 miles for the day. I made poor time for this section of the hike and had to hike an another 7.3 miles to the bear wire that had my name on it! I knew at this point that this would be a LONG day. Cameron Pass. I had to fix the sign for this photo! Mount Olympus is in the back. Lucky for me that I could descend the “trail of shale” in the afternoon. This was a pretty treacherous descent for about 800ft with large patches of snow aligning the trail. 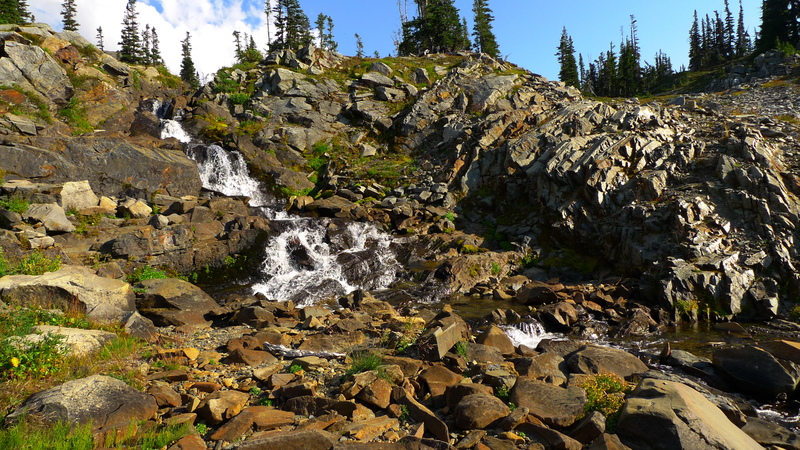 The trail meandered through the Cameron Basin, through varied terrain, including beautiful waterfalls. This entry was posted in Backpacking, Olympic NP. Bookmark the permalink.